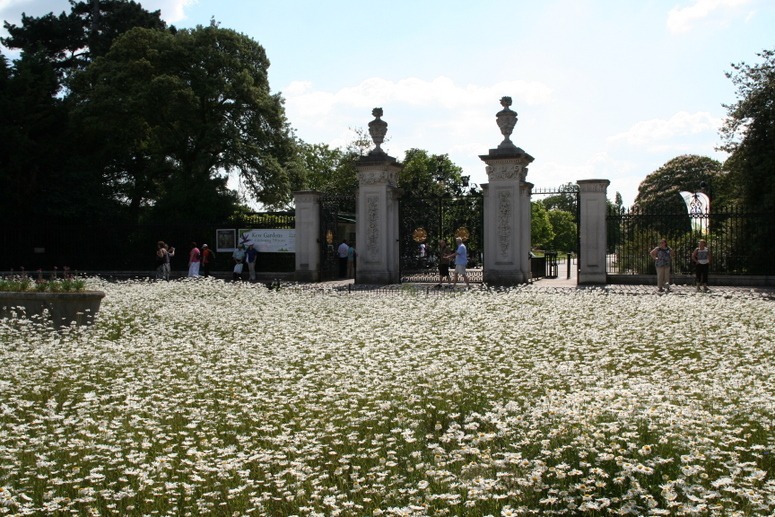 Kew Gardens are 250 years old this year and far more beautiful and interesting than at the time of my first visit. But if the quality is twice as good as it was, it still less than half as good as it could be. I was therefore delighted to learn that an excellent landscape architecture firm (Gross Max, of Edinburgh) has been appointed to advise on the development of Kew Gardens. The change which has made the greatest difference, so far, is the adoption of a ‘sustainable Kew’ policy. You see this in the wildflower meadow outside the main gate (photo above, taken today) and you see it in the long grass under the trees covering perhaps 50% of the garden area. The other big changes are the restoration of old features (eg the garden of Kew Palace) and the creation of new features, including the Sackler Crossing and the Tree Walk. The two missing elements, which Gross Max may be able to provide, are a connection with the River Thames and an overall sense of spatial composition. The latter problem is difficult, because so much of the tree and shrub planting is ‘spotty’ and the new features are being dotted about like rides in a theme park. But the problems are not insuperable and I much look forward to seeing them resolved. One other point: the increase in quality has has been accompanied by a rise in the entry price from one penny to thirteen pounds sterling. There being 240 old pennies in an old pound, this equates (see comment below) to an increase of three thousand one hundred and twenty percent. Kew will be a very great garden when the visual quality has risen proportionately! This entry was posted in Asian gardens and landscapes, Garden Design, garden history, Garden Visiting, Historic garden restoration, Urban Design on 31st May 2009 by Tom Turner. This entry was posted in Garden Design on 29th May 2009 by Stefan. I wonder if the reason for my being more attracted to Avebury is that, because of the remaining trees and the high earth bank, it is still an enclosure. As noted in a previous post on Stonehenge, I believe it must have been an enclosure in woodland. Avebury more-or-less retains this condition and it is highly significant. It was a sanctuary: a sacred place in the sense of a place which was ‘set apart’ from, yet related to, the wider landscape. The photographs, above, show the site of Avebury from Windmill Hill (top). The church steeple can be seen in the centre of the top photograph and on the right of the middle photograph. The road and the barbed wire in the third photograph are an absolute screaming disgrace, equivalent to using Rome’s Forum as a coach park. I am very pleased that they are going to deal with the roads around Stonehenge but, first, they should implement a much cheaper and very much more important project by closing the wicked road through Avebury to motor vehicles. This entry was posted in Historic garden restoration, landscape and garden archaeology on 26th May 2009 by Tom Turner. The National Trust gets money from from legacies, subscriptions and entrance fees. It owns large areas of land to which the public have free access and it has many ambitious development projects which require funds. Some properties consume funds and others generate funds. I think Nymans must appear in the accounts as ‘a nice little earner’. It is not a very wonderful garden but it is remarkably popular, partly because of its motorway-side location. The woods are beautiful and the sign outside the entrance is mean: ‘Car Park Closes Today at 5pm’. One can hardly enjoy a late afternoon stroll in the woods while worrying about one’s car being impounded for the night. 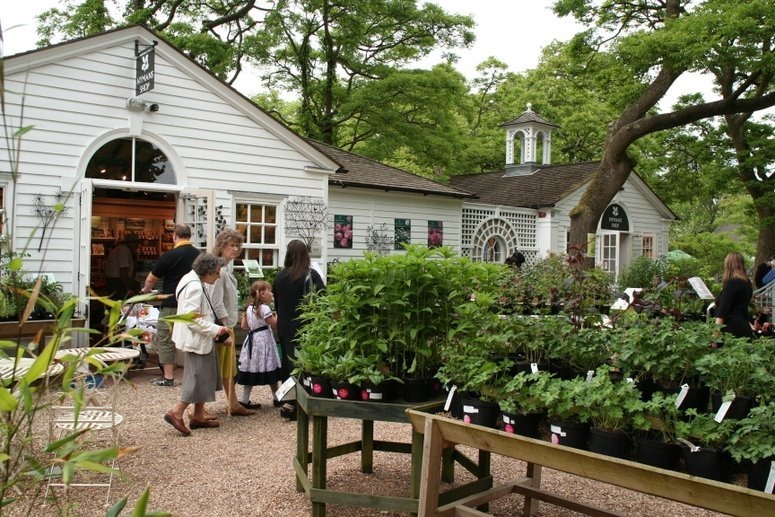 Another surprising aspect of the Nymans regime is the large garden centre. It is very well designed and run but it is almost on the scale of a retail park. Since the planting in the garden is not very well managed, my thoughts about Nymans are that, if it is generating as a big profit, more of this money should be spent on managing the garden and extending the opening hours into the evening. Those who give should also receive. This entry was posted in Garden Design, Garden Visiting, national trust gardens on 24th May 2009 by Tom Turner. Colin Renfrew wrote that ‘Most of us have been brought up to believe, for instance, that the Pyramids of Egypt are the oldest stone-built monuments in the world, and that the first temples built by man were situated in the Near East… It comes, then, as a shock to learn that all of this is wrong. The megalithic chamber tombs of western Europe are now dated earlier than the Pyramids – indeed, they rank as the earliest stone monuments in the world – so an origin for them in the east Mediterranean seems altogether implausible’ (Before Civilization, 1976 edn p.16). This reads like a ‘mine-is-bigger/older-than-yours’ sort of argument. A greater truth is that Stonehenge AND the Pyramids were products of a Neolithic civilization which had its origins in West Asia. And both have a significant relationship to the landscape – which has received insufficent attention. The only certain facts about the placing of Stonehenge are that it was in the midst of an agricultural community and it was aligned with the solstice. It was a sacred place, not on a hilltop and not a fort. To understand such a place, one has to engage with the planning and design of Neolithic sanctuaries, in, for example, the countries which are now Iraq, Malta, Egypt, Greece and France. The best examples are in Egypt and the most useful way forward may be to review what is known about ‘sacred gardens’ (sanctuaries) in Sumer, Babylon, Luxor and Wessex. 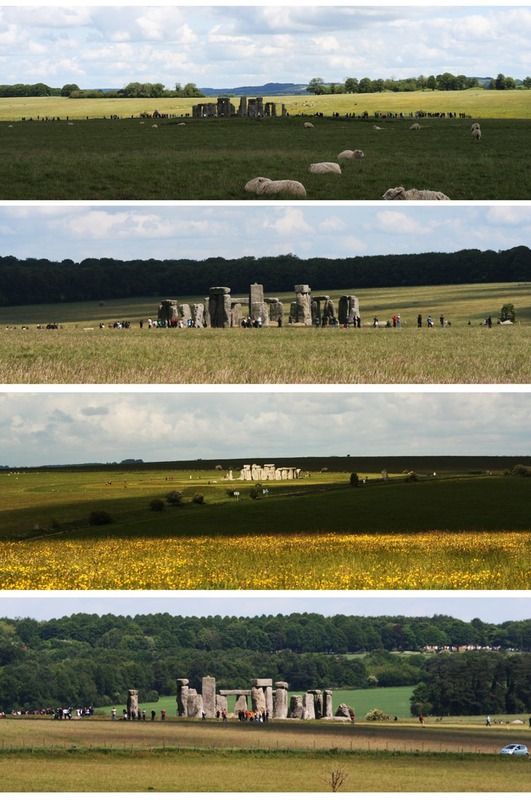 To me, this suggests that the above images Stonehenge with a woodland backdrop are more likely to represent the original situation the views against open downland. I do not think it was not built as an eyecatcher ‘monument’. It was a sanctuary for rituals and ceremonies – and such activities were shielded from public gaze in West Asia. The encircling mound must also have blocked inward views, as the larger mound at Avebury still does. English Heritage is planning a much-needed ‘restoration’ of the Stonehenge landscape and it would be good if a way could be found to allow both ‘woodland’ and ‘downland’ views of the site. Assuming this is not possible, another alternative would be to make a full ‘re-creation’ of Stonehenge in a woodland setting. 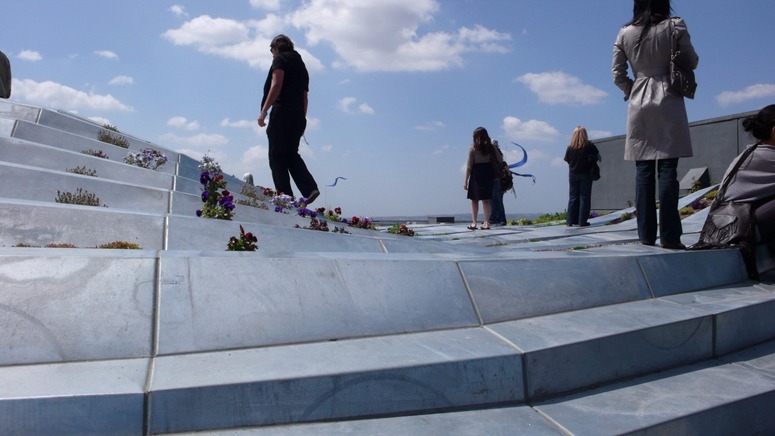 It would not be such an expensive project and it would (1) reduce visitor pressure on the anicent ‘monument’ (2) allow visitors to walk amongst the re-created stones – which might just as well me made in re-constituted stone. 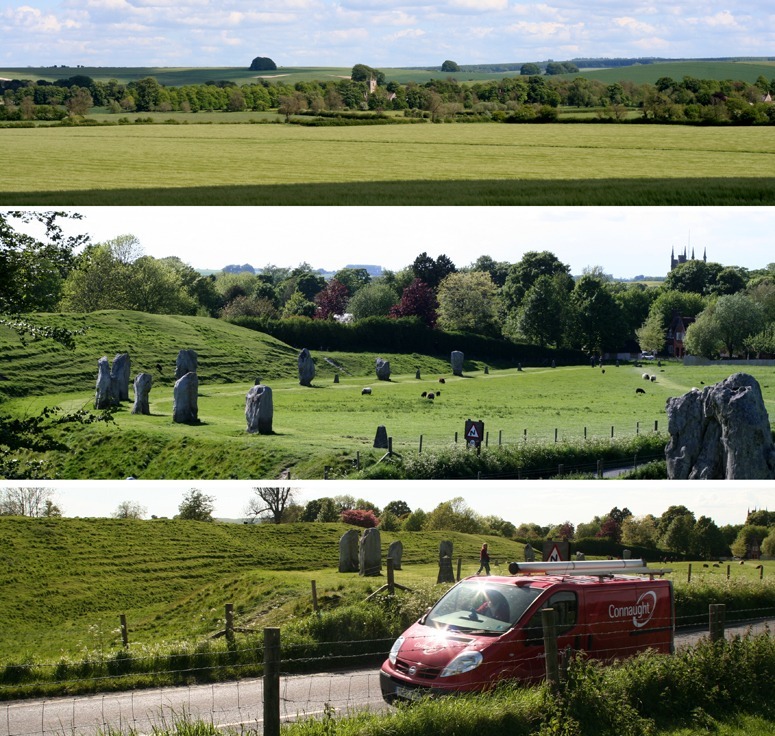 See also: post on the landscape setting of Avebury Stone Circle. This entry was posted in landscape and garden archaeology on 22nd May 2009 by Tom Turner. Chelsea garden design judges 2009: can you guess who are the designers? 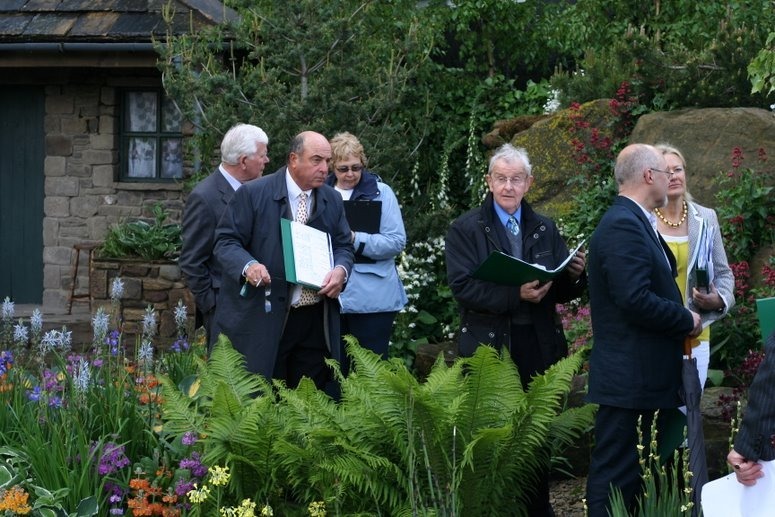 Here are the judges, understandably grim-faced while looking at the recipient of our Worst in Show Award for the 2009 Chelsea Show Gardens. Another problem is they are given the pottiest assessment criteria. The criteria are (1) has the designer met his/her own brief? (2) is the garden as neat and tidy as it could possibly be? (3) does the garden have style? These criteria are better suited to a dog show than a garden design competition. Utilitas: does the garden have functions? Firmitas: is the garden well made, in terms of construction and planting? Venustas: is the garden beautiful/delightful/possessed of high aesthetic or artistic quality? Then they can think about how well the garden meets the promised brief and, if they really must, about whether it is neat and tidy. The ‘style’ criterion should be discarded, not so much because it is irrelevant as because it is confusing and misleading: we want designs to have style but we do not want designers to aim for specific ‘styles’. With regard to the Vitruvian criteria, it is not necessary for every design to satisfy each of criteria, but if one or two are set aside then the second/third should be all the more fully satisfied. See our review of the 2009 Chelsea Show Gardens – and of the judges decisions! This entry was posted in Garden Design on 20th May 2009 by Tom Turner. We were pleased to discover that the owners of Warwick Castle agree with us about the high quality which can be achieved by using fiberglass to make garden planters. 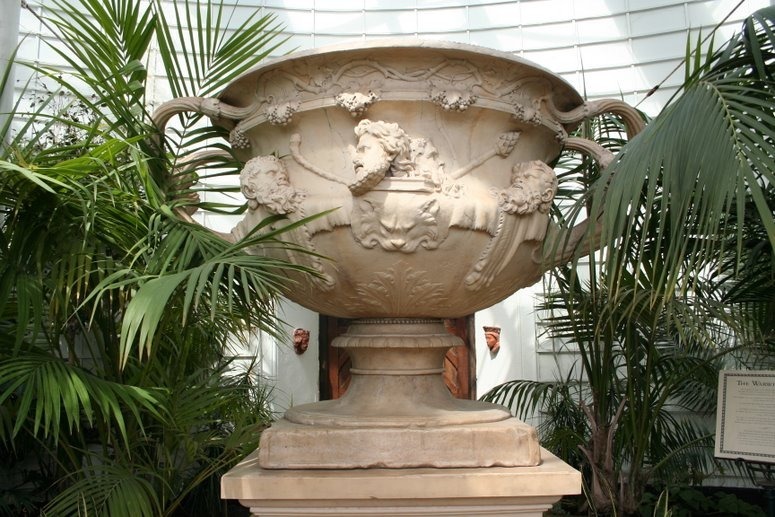 Since the original of the famous Warwick Vase is now in Glasgow, they sensibly commissioned a substitute made in fiber glass, as in the photograph above. The fiber glass planter supplied by Crinklecrankle.com, below, is also in a public place. 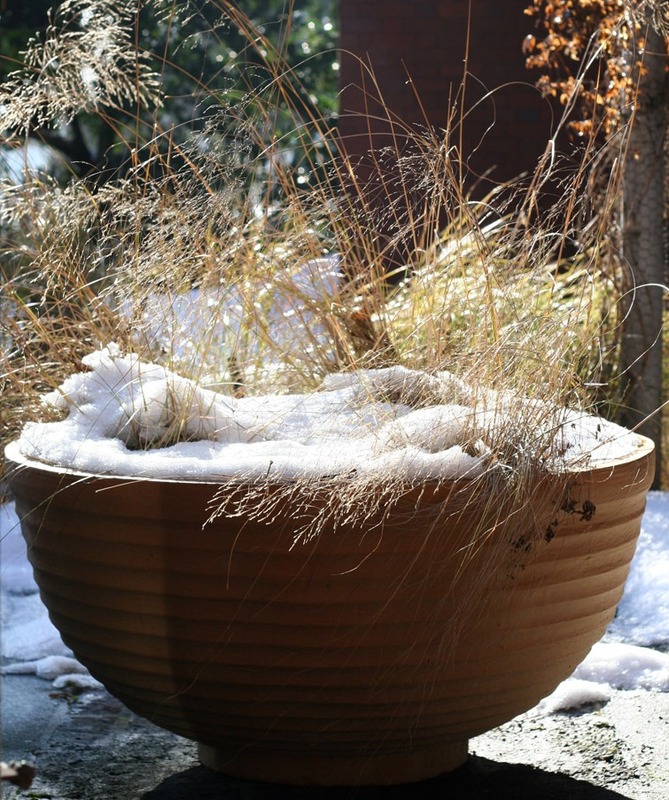 Compared to terracotta, it is much stronger, much lighter, frost-resistant and better at retaining water. This entry was posted in Garden and landscape products, Garden Design on 12th May 2009 by Tom Turner. It is not beautiful. This is the main problem with the Kenilworth Castle garden restoration. They should have put a talented garden designer in charge of the project, with instructions to listen to the historical experts and be sure to produce a beautiful result. Tudor craftsmanship was excellent. This project looks as though it belongs in an upscale garden centre near the M25. The aviary is too big. The fence is too low. The obelisks are too high. The lawn-fringed paths are a total historical anachronism. The elements of the composition are out of scale with each other. It does not have the charm of a medieval garden or the dignity of a renaissance garden. It is a codge-up. Press coverage of this significant garden restoration has concentrated on the cost (£2.1m). I disagree: if anything the budget was too low for a worthwhile project, justified by (1) an archaeological investigation which found the base of the original marble fountain (2) the remarkably detailed description in the Robert Langham Letter, describing Queen Elizabeth I’s visit to Kenilworth Castle in 1575. An excerpt from this letter is quoted below. I worry about Simon Thurley’s garden judgement with regard to gardens. 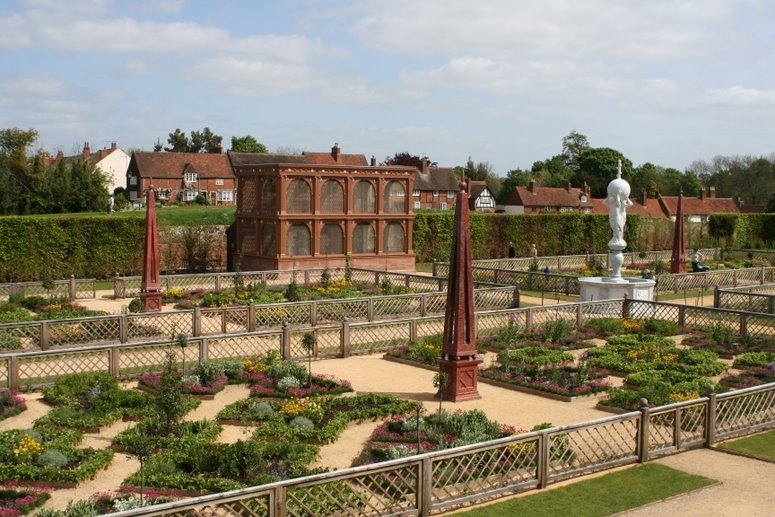 He made a similar mistake with the restoration of the Privy Garden at Hampton Court. There many other things which could have been done with the money – and I would rather have seen a re-creation of a medieval castle garden. We have enough Tudor re-creations from the BBC without EH jumping on this bandwagon – they must be wondering how they could manage some Jane Austen re-creations. If EH thought renaissance gardens looked like this, they should visit Italy and France. This entry was posted in Garden Design, garden history, Historic garden restoration on 10th May 2009 by Tom Turner. Jorn Utzon called green roofs ‘the fifth façade’ and there are many ways in which the public can interact with the new landscapes evolving on roofs in our cities. Green roofs can be public space, private space or ecological space. 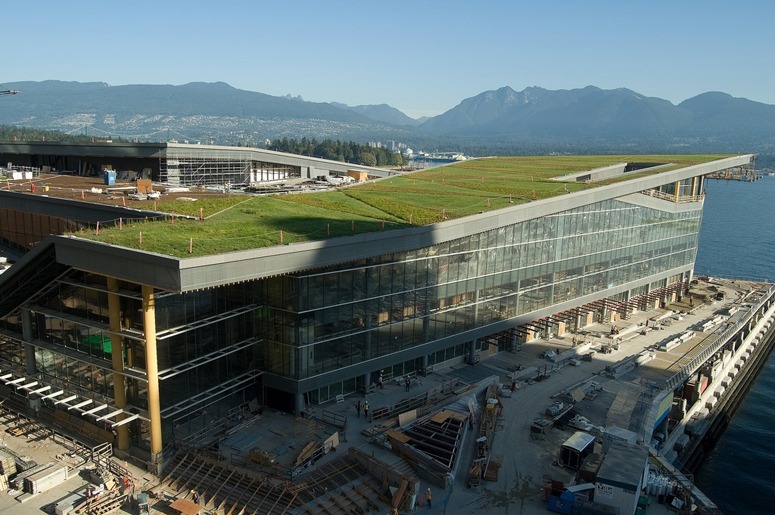 The Vancouver Convention Centre is a great example of a green roof that is best viewed from on high, to appreciate the relationship between the man made and the natural landscape. The promotional images for this fantastic new building http://www.vancouverconventioncentre.com/thefacilities/image-gallery/ suggest that Vancouver has understood much of what has been achieved with this building But the full potential of the roofs as integral parts of cites has yet to be fully realised. Synthe Roof garden in Los Angeles is a laser cut roof surface that has been sculpted for landscape opportunities and for foot traffic on the surface. The garden is in the care of a popular restaurant in the building below. From this vantage point a different perspective on the city of Los Angeles is possible, as is the potential for more interesting forms of roofscape use and greening. This roof design suggests that new forms of roof + garden will be discovered through the green roof concept. 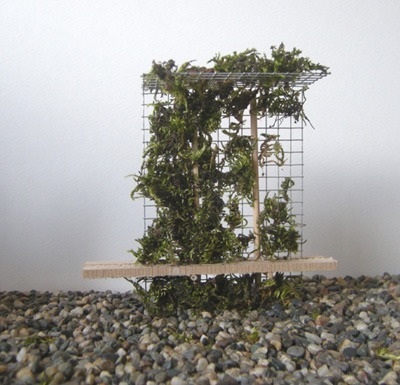 This entry was posted in Sustainable Green Roofs, Urban Design on 4th May 2009 by Christine. green roofs, green streets, green walls. how about some green seating? 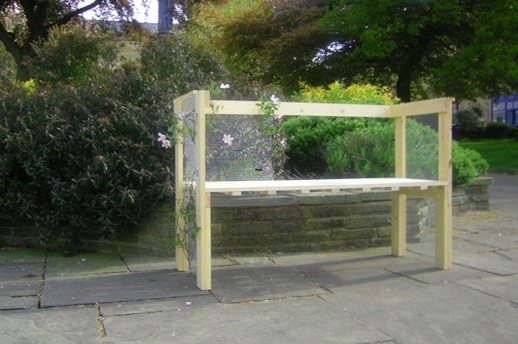 this prototype bench incorporates a trellis to allow plants to grow around it. its a little clunky at the moment, but the design and construction are deliberately lo fi, so it makes a good Do It Yourself project. also i imagined it, when overgrown, looking something like a 3d Mondrian painting, as the photoshopped images here, hopefully show. This entry was posted in Garden Design on 4th May 2009 by Stefan. 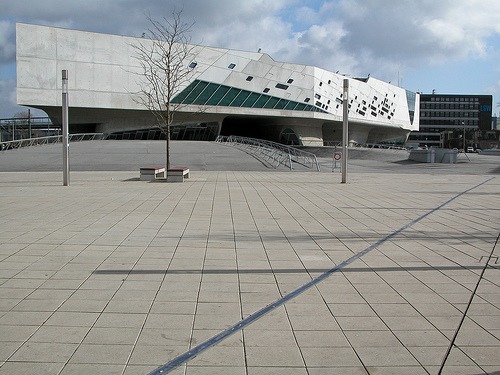 Zaha Hadid has a wonderful design sense – she could have been a sculptor. The BBC devoted a profile to her recently ( http://downloads.bbc.co.uk/podcasts/radio4/profile/profile_20090404-1900a.mp3 ) and in it Simon Jenkins remarks that ‘I don’t think she does context: she does concept’. He imagines all her buildings isolated in the Iraqi desert – like the Phaeno Science Center (photo courtesy maurizio mucciola) in Wolfsburg. It was a world-scale tragedy when, in 1893, the World’s Columbian Exposition turned the course of American architecture away from Sullivan and Wright and back to Italianism followed by European Modernism. The BBC also broadcast an excellent profile of Frank Lloyd Wright on 9th April 2009 http://www.bbc.co.uk/iplayer/console/b00jjjpv. He drew on the classic inspiration of landscape architecture: NATURE. This entry was posted in context-sensitive design, Garden Design on 2nd May 2009 by Tom Turner.